17 Feb 1997- She had a routine call with Ushant traffic, when passing the Traffic Navigation Scheme. She was on voyage from Antwerpen, bound to Jamaica, with steel beams. The weather was bad. 05/03/1997- Concerned by the delay taken by his ship and without news, the owner alerts the authorities. A navigation warning was sent and received by a Danish trawler who remembered she had met a very big echo sound in position 48°18.8'N et 006°08.7'W, on Feb 18th. 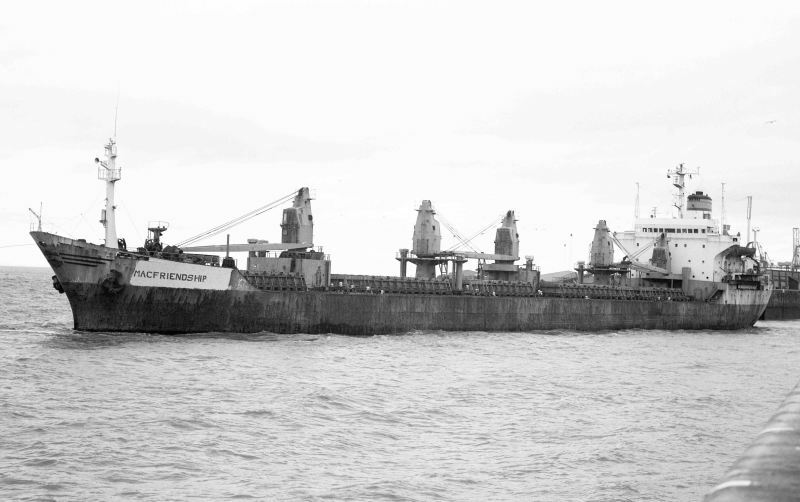 The French mine sweeper CROIX DU SUD went on the area and found the bulker, upside down, on the bottom of the sea (130 m). Twenty five men lost their live at 100 km of the coast, in silence, without anyone knowing about the drama. May 1999- Following the request of the seamen families, the survey ship STM ATRIA is sent to the area by Cyprus Authorities and by insurance company, to investigate the wreck, in order to know the reason of the casualty. It is a bit obvious, but not only the cargo seems to be scrap metal.